PixelTANGO (aka “pt”) is a set of abstractions and externals, for pd/GEM, that make using pd and GEM easier, faster and more satisfying. The purpose of pixelTANGO is to foster creativity in the area of live visual performance and make open-source software more accessible to visual artists. The purpose of pt is to balance usability and ease of learning with programmability, modularity and flexibility. This balance means that pt will always be playing catch-up to build easy to use interfaces to the ever growing and complex functionality of GEM. This means that often pixelTANGO will be used with “traditional” pd/Gem programming for and by artists to create performances/installations as well as contribute more specialized pt modules back to the community. 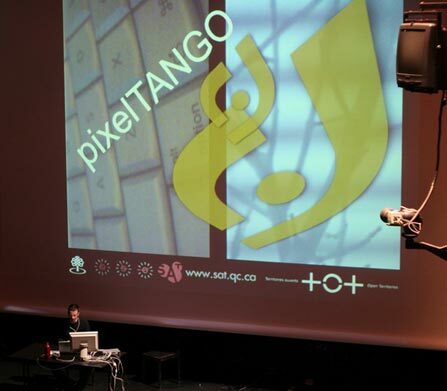 PixelTANGO can be used to: Create animations live, Create interactive installations, Work with full-quality DV Videos (movie files, fire-wire and network streams), Create images in both 2D and 3D Remote control using Open Sound Control, MIDI and AID. Vjs, visual music performers and visual artists interested in alternative free software. Any users of pd/Gem are also encouraged to attend. We acknowledge the support of the Canada Council for the Arts.